The results of the students council election at Panjab University were announced on September 6, giving a blow to the rampant culture of ‘money­-muscle politics’ in public educational institutions in the country. 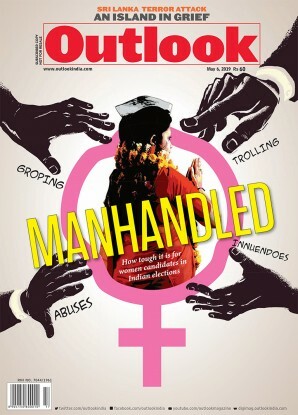 The Panjab University Campus ­Students Council (PUCSC) got its first woman president—the confident 22-year-old Kanupriya, who’s a member of Students For Society (SFS), which is an independent organisation unlike most other organisations competing at the university, which are ­extensions or ‘wings’ of bigger, nati­onal political parties. The Left-leaning SFS is a relatively new organisation. It was formed in 2010 and gained prominence when it fought against the university fee hike in 2013. It had also earned bad name last year in connection with some campus violence. On the whole, SFS’s politics seem to be a foil to the established culture of political tactics at the university. It has criticised other parties for offe­ring freebies to students in exchange of votes and not giving enough attention to real students’ issues. The ext­ent of how much the university’s politics is patronised by big parties can be seen in former Punjab deputy CM Sukhbir Singh Badal’s visit to the campus for the oath-taking ceremony of Akali Dal’s SOI president in 2015. The SFS had fielded woman candidates in the elections in 2014 and 2017 as well, but victory eluded them. Finally, this year, SFS, with Kanupriya as the candidate, managed to win the top post in the council defeating ABVP’s candidate Ashish Rana by a margin of 719 votes. “Pittr-satta ki kabr khudee hai PU ki dharti pey (patriarchy’s grave has been dug on PU’s soil), was my reply to the patriarchal mindset I encountered during the campaign,” says Kanupriya, who used her dafli (tambourine) to aid her voice during campaigning. “Patriarchy’s grave has been dug on PU’s soil,” says Kanupriya, PU’s first woman president. The tambourine girl, who’s a second year MSc zoology student and an animal lover, proved her point loud and clear. 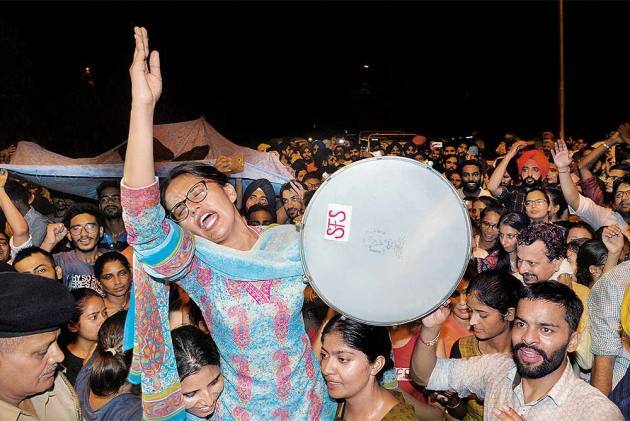 The Congress-supported National Stu­dents Union of India (NSUI), the BJP’s ABVP and the Shiromani Akali Dal’s Student Orga­nis­ation of India (SOI), all groups with a reso­u­r­ceful mother party, were ­defeated by the SFS against all odds. 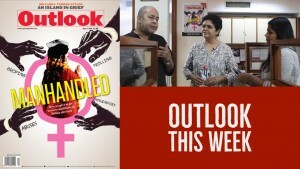 Kan­upriya all­eges that the university aut­horities even made effo­rts to help the ABVP candidate win the election. But now that she has won, Kanupriya looks resolute to bring the required change on the campus. She even asked the university’s VC, Raj Kumar, to not interfere in students’ matters unnecessarily. “The VC told me to take baby steps, to indulge the student council in cleanliness drives in the university. Yes, cleanliness is important, but there other big issues also, the students’ issues, I am not going to leave those out,” she says. Kanupriya, who comes from Patti, in Tarn Taran district, 30 kilometers from the India-Pakistan border, clarifies that despite being on the Left side of things her party is not linked to any big communist party. “We are an independent body. This is our ideology. We are against the caste system, and for equal rights to women, in fact for every human being alive,” she says. The SFS also appears to avoid getting appropriated by bigger parties. A party member’s refusal to rec­eive felicitation from a veteran leader of the Communist Party of India after the election is one example. “We have rec­eived calls from left party leaders, I am happy about that, but I want to function independently,” says Kanupriya.